I find herb growing to be a very enjoyable and delightful experience. There’s nothing quite like taking a stroll through the herb garden on a warm summers’ day, than bending over and crushing some aromatic leaves in your fingers. Most herbs are very easy to grow and very forgiving plants even if slightly neglected. I did say ‘most’ herbs because there are some that are far more difficult to grow and can be healthy one day and dying the next. I decided to write about some more common herbs available to the avid gardener and tried to keep the inclusions to those plants that the beginner gardener would find easier to grow. I did include some more difficult species, simply because I can’t help myself and I thought you might find them interesting. This is by no means an exhaustive list. I do intend to add more varieties and construct a far more comprehensive guide in an ebook I am developing. However, that’s for the future. In the meantime this current blog, “Herbs for the Garden” will cover a selected variety from A to C.
I am currently developing further blogs covering the remainder of those plants that I have selected for you from A to Z. All these blogs will form parts 1 to 8 of a series. PART 1. Herbs For The Garden. If you’re a beginner Gardener I wouldn’t encourage you to grow all the herbs listed in this article. Start of with the basic species that you will be able to use in your day to day lives. Herbs such as basil, rosemary, thyme, sage and rosemary are all used in day to day cooking and are some easiest varieties to grow. Fresh herbs are always far better to utilize in cooking than dried ones. Often we don’t really know just how old the dried varieties are. They may have package ‘use by dates’ on them, but who knows how long they would have been in storage before being packaged. We will begin part one of “Herbs for the garden The A to C of Herbs”. A to C of Herbs. Common names: aniseed, sweet fennel, sweet cumin, anis vert or yank. The plant has a hollow stem and alternately arranged leaves. The lower leaves are feathered with round toothed edges while the upper leaves are feathered progressively towards the top of the plant. The anise plant usually produces umbels of bright white flowers and flat, oval, hairy fruit which has a single seed. The anise seeds are usually brownish to grey-green and develop on long stems that are ribbed and ovate and measure 2 to 4 cm long. There are two styles of leaves on the plants, those at the base are simple, 1 to 2 in (1–5 cm) long and shallowly lobed. The leaves higher up on the stems have a feathery appearance with each leaf divided into numerous small leaflets. The leaves omit a delicious licorice and sweet fennel aroma during the warmth of the day. The Anise plant originates from the Eastern Mediterranean and South West Asian regions. It was highly sought after and cultivated for its egg shaped fruits, or seeds, which have a licorice flavor. The anise plant is used primarily in Europe to flavor biscuits and cakes, and is also used to flavor savory foods, fish soups and root vegetable dishes. The leaves can be eaten in salads, with vegetables and some cheeses. The seeds are also used to flavor some strong alcoholic liquors. The essential oil produced from the seed has many known to have many medical benefits. The fragrant oil known as anethole is utilized in scented oils and soaps. It is also incorporated into many herbal medicines and is known to alleviate stomach pains as well as being anti viral and being useful in destroying, or controlling, many of the bad bacterial pathogens. In ancient times it was supposed to have had Magical usage. Traditional believers used anise, especially in the Roman era, to avert evil. The fresh leaves of the Anise herb would be placed in a room to drive off evil spirits. This plant develops umbels of very pretty, lace like, flowers that grow on tall hollow stems that can reach up to two feet or more in height. It is an ideal ornamental plant that would look good centrally placed in any cottage or herbal garden. The flowers have a remarkable resemblance to the “Queen Anne’s Lace’ plant. The Anise plant thrives best in a tropical climate with temperatures that lies between 6 and 24-degree Celsius. It doesn’t tolerate frost very well. The plant will thrive in a sunny position in the garden, preferring full sun. Anise will grow in many soil types as long as the ground is well-prepared, free draining and has plenty of rich organic matter incorporated into it. PH levels of between 6 to 7 are preferred, however, it can survive in slightly lower or higher levels. Anise is best grown from seed and planted directly into a previously prepared location in the garden plot where you want it to grow. This plant doesn’t transplant well and those seedlings that are transplanted usually don’t survive. The developing plant will need regular watering, at least until the plants are fully established. Once established they will tolerate long periods of dry weather. The Anise plant may be harvested in August to September when the flowers go to seed. You can place the seed heads into a paper bag left hanging in a dry place and away from vermin. Once the seeds fall out you will be able to either store them in a dry, dark, cool place until spring for replanting, or utilize them in your cooking or for oil production. The leaves of the plant can be harvested at any time during the growing season and used in salads or food recipes. Common Names: Angelica, Garden Angelica, Archangel, Alexanders. Angelica is part of a Genus of approximately sixty species of either biennial or perennial herbs that are native to the temperate and subtropical regions of the northern hemisphere. For the sake of simplicity and the fact that it is the most widely used of the genus, I will be discussing Angelica archangelica in this article. 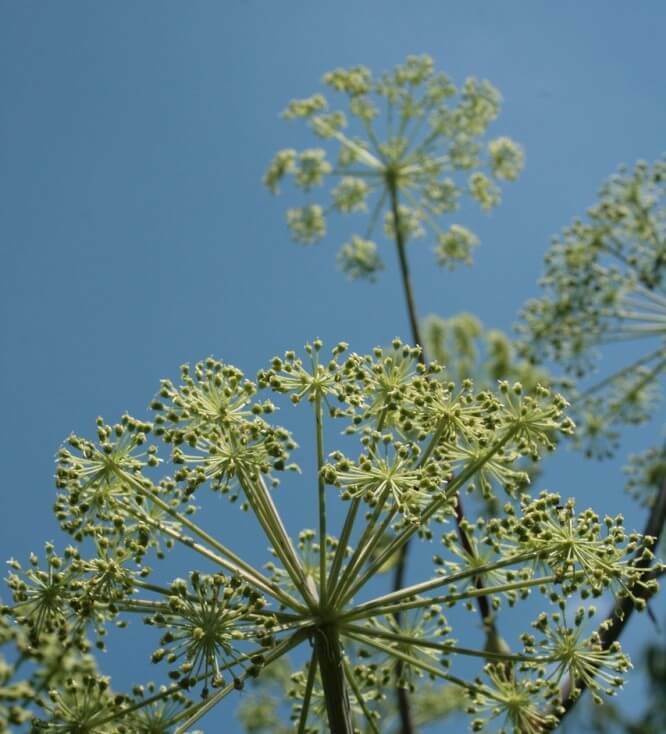 Angelica is a biennial herb that grows to a height varying from 3 to 6 feet (1 to 2 meters). However, it can display perennial characteristics if the flowers are cut off before they die. By doing this the plants life can be increased by a number of years. The large leaves of this plant divide into tooth like segments, and greenish white flowers form a ball on top of the tall stalks. These balls can grow to 6 inches(10 to 15 cms) across. The stems of Angelica are often candied and used in cake decoration. The leaves can be added to salads adding a slightly sweet, licorice flavor. The roots are often treated as a vegetable and make a delicious addition to any meal. Much the same as ‘Orris’, the roots are also used as a fixative for making potpourri, other parts of the plant, including the flowers, can also be dried and used in the mixture. The leaves and seed can be made into a tea to use as an elixir to treat colds and arthritic pains. Because of the height of this plant when in flower, it can be used as a ‘backdrop’ plant in any cottage garden setting. The flowers are an attractant to bees and other beneficial predatory insects. This beautiful herb prefers cool climates but will grow in most temperate zones if protected during hot summers’. If you are living in a warmer zone and wish to try growing Angelica, plant it in a light but cooler, shaded part of the garden. Ideally it’s wise to situate this plant in an area that receives morning sun and afternoon shade. Angelica thrives in a well drained, healthy, rich soil. Make sure that you keep the soil moist but not wet. The best pH levels are those between 6 to 6.5. This striking herb is best grown from seed. However, the seed should be sown while still fresh and either directly into the area you want the plant to grow, or It can be grown in seedling trays and transplanted later. 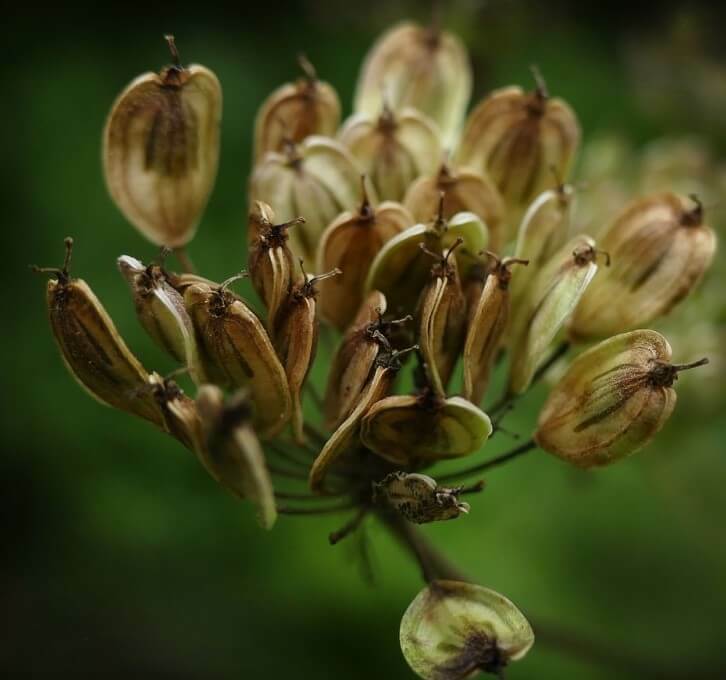 Angelica self seeds readily in cooler climates. The leaves and stems of this versatile plant can be harvested at any time during the growing season before flowering occurs. If you’re after the seeds they can be harvested when they begin to brown. Place the whole head of the flower ball into a brown paper bag and leave in a dry, cool place. Some people have had success when leaving the heads hanging from a drying rake in full sun for a few hours before placing them in the bag. This way you can be sure the heads are properly dried and won’t encourage mold. 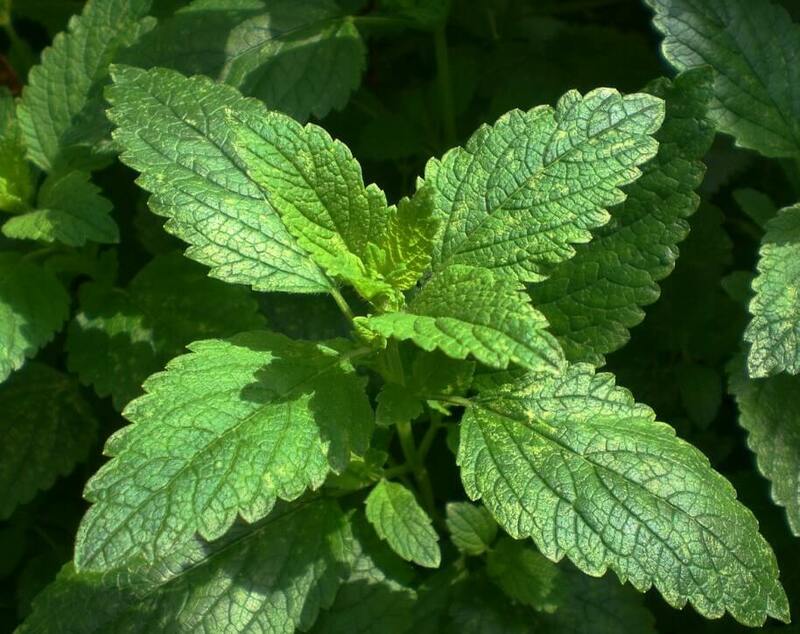 The Balm plant is a member of the aromatic herbs of the mint family Lamiaceae . It is perennial herbaceous plant that is native to south-central Europe and the Mediterranean. The leaves of this herb have blunt tips, while the base is wedge-shaped to round. The foliage has a natural lemon fragrance and bland taste, although this varies with the cultivar. Balm is a clumping plant that grows from 30cms to 90cms (1 to 3 ft) in height. The blooming period usually occurs from the late spring to late summer. Often only a few flowers bloom at the same time on an individual plant, which suggests blooming spreads over a rather long period. The young fresh leaves from balm are used in milk puddings or fruits salads. The herb is also used as a flavoring agent in some alcoholic beverages and liqueurs and in herbal teas. The leaves of the balm bush are used to clean sores, preventing infection, and for easing the pain of gout. It induces perspiration and makes a soft cooling teal that is used by feverish patients in the cases of catarrh or influenza. Other uses are for mental performances, alleviating depression, restlessness and more. Dried leaves are another ingredient often used in potpourris. This plant rarely flowers out of its own climatic zone. However, it does grow well in other regions and is a useful little border plant. There is a variegated variety available that at least gives some foliage color. Balm is another versatile plant that is said to prefer hot dry summers and cool to cold winters. It can however tolerate both cold and heat if grown in the correct part of the garden. In temperate Zones the plants tend to die of in winter and return in spring. Balm can tolerate direct sunlight but thrives in shade. Try to avoid growing the plant in full sun in regions that experience spells of long hot sunny weather. The plant will grow far more succulent in a shady position. This herb can tolerate a relative wide pH range that is between 5.6 and 9.0, but has a preferred range of between 6.0 to 7.5. Lemon balm is very easily propagated from seeds. Simply place the seeds where you want them to grow in the garden, cover only very lightly, water in and they well grow for you. Once the clumps have established you are able to dig them up and divide them to provide you with an abundance of new plants. You can than give some away to your family and friends. They also grow easily from cuttings, but this is probably not a very economical way to produce them as they grow so easily from the other methods I’ve mentioned. Common Names: Basil, Sweet Basil, St Josephs Wort, common Basil. I love everything about this incredible herb, from the wonderful aroma you can create when squeezing the leaves on a hot summers day, to the delicious flavors it releases when used in various food dishes. Basil is another easy to grow plant that should have prize of place in either your herb, vegetable or ornamental garden. Originally it was considered a perennial in its native country of India. However, today basil is grown around the world and treated as an annual in most climatic conditions. 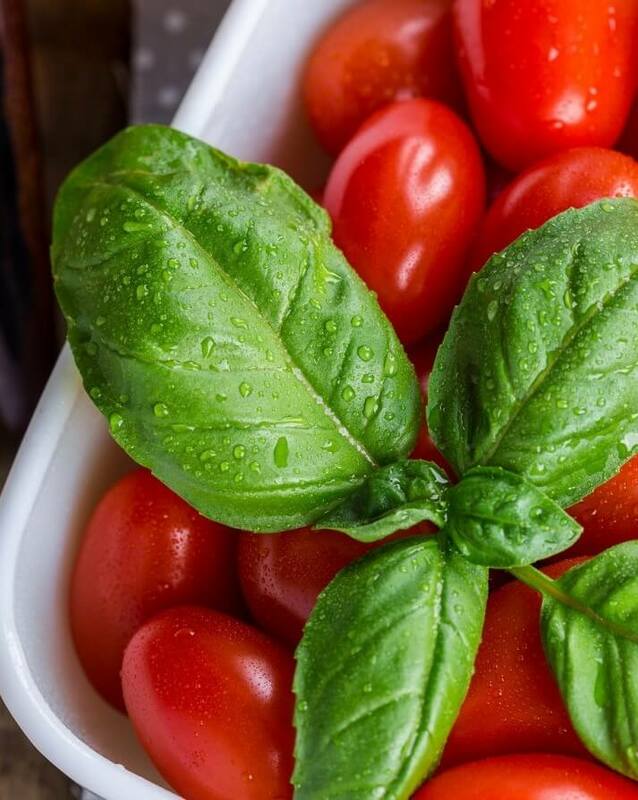 Basil is a tasty herb that is widely used in many kitchen dishes but best known for its flavor enhancing qualities in pasta dishes when teamed up with oregano or marjoram. You can use it to either garnish a meal such as soup, or add to other dishes at the end of the cooking period. The plant has also been used in both ancient times and modern, for the relief of stomach issues, loss of appetite, and as a balance for constipation or Diarrhea. Although not known as an ornamental plant, I believe it looks great in any garden setting and can be used as a filler plant, or simply for its fantastic aroma. The little purplish white flowers it develops, will also help enhance the edgings of any cottage garden. Basil is another one of those herbs that is often classified to suit particular climate zones. The truth is that it has adapted well, growing in many places around the world. The plant can be found doing well in the sub tropics and absolutely booming in colder climates. I wouldn’t be afraid to try it in any zone, except maybe the northern arctic. The fact is that even in areas where it has a limited growing period, it is worthwhile trying it because the plant grows so fast that you will still get to harvest it I time. You will than be able to dry any surplus to provide you with enough of the herb to last until the next season. Basil loves full sun to part shade. I would simply grow it in an area where it will get enough light and sun without ever getting to hot or to cold. In other words, the hotter the climate you live in, the more shade you could allow it to live in. This popular herb is easy to grow in most soil types as long as it is well drained, and compost or animal manures have been added to poorer soils. Basil will grow easily in ph levels of between 5.5 to 6.5. Having said that, many people have reported success in ranges from 5 to 8. This is one plant that germinates readily, so it is best grown from seed. You can plant them in a container or seedling tray first and than transplant into a suitable spot in the garden, or you can place the seed directly where you want them to grow. Pick the leaves of this versatile plant during its growing season and use fresh in your food dishes, or harvest the whole plant before it bolts and dry the leaves in a ‘commercial style’ drier. What a wonderful herb to have in your collection. The humble bay tree makes a great center piece in any herb garden. It holds its own in a cottage or informal garden and can be hedged in a formal setting. This incredible plant is easy to grow and can handle a fair bit of neglect. This true Laurel plant is an evergreen tree with small dark green leaves. It makes an excellent showpiece when grown directly in the garden or in a large pot, where it can be clipped and shaped according to your desire. If grown directly, please remember that it can grow up 10 meters or 33 feet in height. 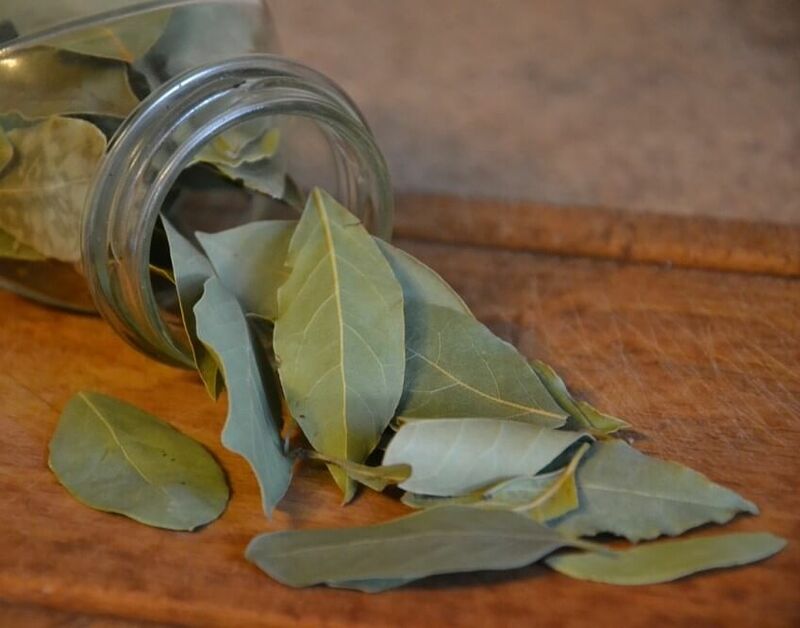 The Bay leaf is one of the ingredients used in making a ‘Bouquet garni’, which consists of a number of herbs either tied together with string, or placed in a small muslin bag, and placed in stews, soups or stock. Many years ago my wife and I had great pleasure in constructing these little bags and selling them, along with other herb products, at a local market stall. The leaves are also used individually in soups ,stews and when cooking corned meat or silverside. Some people recommend the use of dry leaves only, as they have reported a slightly bitter taste from fresh leaves. However, we have always used the fresh leaves with no real issues. Bay leaves were, and still are, used in the production of ‘Potpourri’. These mixes consist of a variety of dried flowers and herbs, including rose petals, that are fixed together with Orris root powder. Unfortunately these sensational, aromatic products are rarely available today. You are still able to purchase the synthetic varieties in most stores, but they don’t come close to matching those made naturally. As already stated, these small trees look fantastic when grown in pots or the featured in a garden setting. They are easily shaped into hedges or utilized as a center piece in either the herb,vegetable or ornamental garden. Although the Laurels home base is in the Mediterranean regions, it can be easily grown in most climatic zones. The plant is fully hardy in temperate to subtropical zones and can withstand cold conditions as well. In the coldest areas its best to grow the herb in a pot and bring the plant indoors or into a hothouse during the worst of the winter weather. The Bay tree prefers to be grown in full sun or partial shade. However, i extremely hot conditions I have seen it growing beautifully in areas that only receive morning sun. Like most plants, the Bay tree prefers a well drained soil. It performs well in most soil types but doesn’t like heavy clay conditions that become easily waterlogged. The laurel tree prefers a Ph level of between 6 to 8. It is possible to grow the Bay tree from seed. However, seed can be both difficult to obtain and to germinate. Fortunately it is very easy to grow this plants from bot soft wood and hardwood cuttings. Hardwood is the easiest of the two methods available. It’s best to harvest leaves from trees that have had a chance to reach some level of maturity. Personally I would leave them for at least two years. Pick the leaves once the morning dew, or any rain, has thoroughly dried off. But don’t leave it to long on a hot sunny day. Place the leaves on a drying rack . It is simple to construct one of these using and old fly screen door. Leave the rack in a warm dry place, safe from insects and rodents, for approximately 2 weeks. Turn the leaves every few days and make sure they are kept out of direct sunlight. Once dried, keep the leaves in an airtight jar or plastic zip lock bags. If the drying process is performed successfully, these leaves will last at least two years. If drying the leaves seems like a daunting task, and you’re after quicker results, you can purchase a drier online. Common Names: Chinese parsley, Kustumburi, Persil Arabe, Persil Mexican or Dhania which originates from India. This unique herb is known by the two names depending on the part harvested. When the leaves are harvested, it is called cilantro, whereas if one harvests the seeds, they are referred to as coriander. 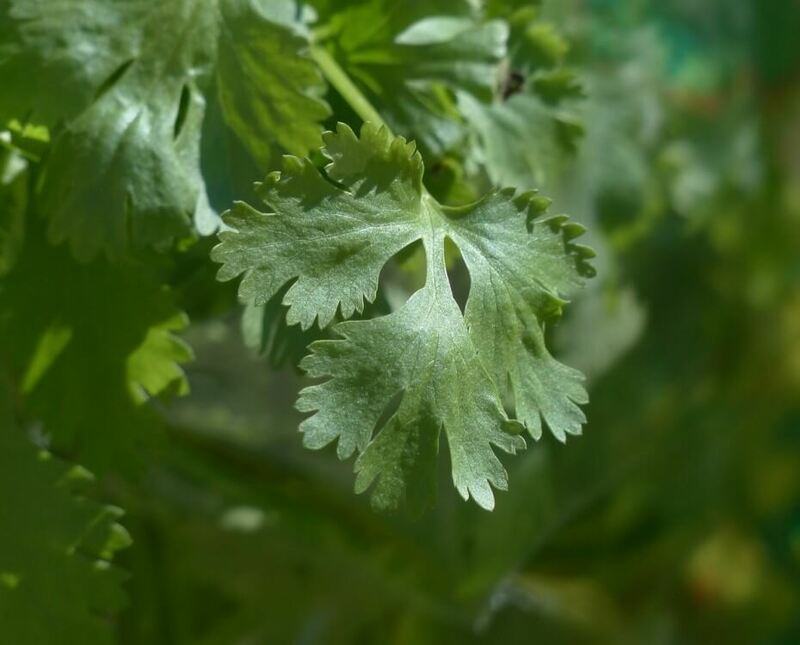 Cilantro leaves usually taste much different from the seeds. The plant has a deep flavor and odor. The herb produces an oval shaped fruit which has a yellow-brown color and consists of two seeds. Both the seeds and leaves are used as flavoring agents in many recipes. Most often it is used when cooking salsa, fish or chicken dishes. Cilantro is taken orally to treat cancer and to remove poisonous metals from the body such as lead, mercury or aluminum. Coriander is used in natural medicine for digestive issues including nausea, diarrhea, intestinal gas and other stomach related issues. Other uses it has includes treatments for toothaches, worms and measles and for the control of infections caused by bacteria and fungi. Although this is plant is not widely know as an ornamental plant, it can be placed in the garden as a filler. The pretty parsley like leaves gives the herb almost a fern like look and the small delicate white flowers, that adorn the top of the long stems, are an enhancement to any garden setting. Coriander is basically a cool climate plant that will tolerate cold temperatures at frost levels. It also grows in area that have relatively hot summers and cool winters. However, if the temperature goes over about 85f (29c) the plant will bolt to seed. This plant relishes full sun but will grow in semi shade in very hot regions where it protected from the afternoon sun. Coriander grows to its optimum size and quality in well drained, sandy loam soils. But will also perform in other soil types if the drainage is sufficient and compost or fertilizers have been added. Cilantro or coriander tends to grow within a relatively wide Ph range from 6.1 to 7.8, however the ideal range is 6.5 to 7.5. It is best to grow this plant by seed placed directly where you want the plant to grow. However, it can also be grown in seedling trays in late winter and planted out when the danger of severe frosts is gone. Make sure you plant the seeds early as this way you can harvest the plant for the leaves before it bolts to seed. The leaves can be harvested anytime during the growing season and added to you favorite recipes. The coriander seeds early in the day when the dew had evaporated off. Don’t leave it to late as the hot sun can remove essential oils within the seed while it is drying. You can hang the long stems of the plant upside down preferably in a brown paper bag placed in a dark, well-ventilated room. Shake the bag every now and than and the seeds will fall into the bottom of the bag. They should than be stored in an airtight jar where insects and rodents can’t feed on them. That covers my article on “Herbs for The Garden The A to C of Herbs”. Please watch out for my nest blog that will include herbs from D to F.
The list of herbs mentioned here is by no means exhaustive. I do intend to construct an ebook on herbs from A to Z in the near future. The project could take at least a year to complete and will be far more comprehensive than the format used here and will cover many more varieties as well. If you have any questions regarding this blog, or believe you can add to the knowledge provided, I would be more than happy to hear from you. Please either leave your comments in the box provided below, or if you would like to make the discussion on a more private level, you can send me an email in the “Contact Us” tab at the top of the website. I came across your post as a member of Wealthy Affiliate and I was really interested in your herb post. I live between Philippines and Thailand and next year will be building a property in the province and we were talking about growing our own food and herbs just the other day. I think we live in a climate that is ideal for most herbs and when the time comes, I will come back to your post for ideas and guidance. It looks like a very rewarding hobby! I loved the simple layout of your site. Hey Jim, I’m a fitness trainer and my clients are always asking me about ways they can improve their health and fitness. I always tell to keep their food intake natural. Herbs are the way to go. I’m loving your site. So much I want to know, so I’m going to explore your page a little more and I’m also going to spread the word to my fellow medical folks who like the natural way of things…. great site. Great list of herbs Jim, I am one of those who love to grow herbs. I learned herbs from my late farther, I have a lot of herbs in my home garden like lavender, oregano, mint and many more. But after reading your list of herbs, I found that my garden is missing Basil. I love its many uses and as one who occasionally suffers stomach pains, I will have to add it to my garden. My dad is a traditional herbalist and so I’ve grown in an environment where going to hospital was quite a rare case. We used to take herbs from the forest and even though I used to hate the practice as a kid because I thought it’s too primitive, I came to like it afterwards. I’ve now finishing constructing my house and around it I’m planning to make a home Garden comprising of vegetables and medicinal herbs. This post has really encouraged me and I was going through all these different species but am still not sure which ones can grow best in tropical climate areas. I’m interested in herbs that can helped cure sickness.I always used herbs for cough and other sickness like dengue fever which is very helpful. Your site is very educational and insightful..
Hi Jack. Keep an eye open for Parts 2 to 8 of the A to Z of herbs. Each herb will have a section explaining it’s medical usage. This was extremely insightful and resourceful for me. I’ve never known much about plants, but as I started caring more about my health and opting for the healthy options, an inside eagerness to learn about them were silently emerging. Which very recently has become this interest that is very dear to my heart. Always excited to learn new stuff. I was actually surprised that many of these plants I have seen at grandparents house, or nearby it anyway. I had no idea about the names, but the plants in pictures I do recognize. Needless to say that I had no idea of their solid uses in culinary and as medicine. Jim, I really like how in-depth you are about each plant. Can’t wait for that e-book. Jim, I’am so impressed with your website ! You have so much good info on gardening and the herbs I didn’t know they had so many good properties even though I have some in my garden. Everything looks very professional, from the green headings to the detailed information on so many gardening topics . I read most of the herbs because I’am fascinated by them and how good they are for you and will be checking out all the other topics later as I have made a special notation of your site , well done ! a fairly comprehensive list for the first a too c guide.the only one i have managed to grow with much success is the basil. Rosemary also managed to grow..i tried bay and i dont know if it was overwatered or the soil was wrong..what water cycle would u suggest i was watering every other day..my basil liked it my bay disagreed.? The only thing I miss about not having a house is my herb and vegetable gardens. Love your post, and agree that walking through a herb garden is pure heaven. I grew a lot in pots as being in the tropics, in summer when it rained it didn’t want to stop. This allowed my plants to survive better in the hot, wet months. Of the herbs you have analysed I grew Lemon Balm, Basil and Coriander. Even with temperatures over 30 degrees for 7 or 8 months of the year, they mostly survived by changing their location so that they had a cooler spot. In times of extreme heat, they even came inside. The things we do for our plants. Great article mate. I’ve just visited my brother and he has a herb garden and I am returning home to start my own herb garden. I know a lot of herbs, since I’m a real greenfinger/healthy person, I’m in the health and bodybuilding world for quite a while, so I have to know these things. It is really nice you want to help people to have a healthy life with herbs, and how to plant them. I have a huge garden, so I have like 15 herbs in them, and I love reading the info you gave here. I am so glad I stumbled onto your site. I am a super keen gardener and will be looking further into your posts. Your article on herbs A – C has piqued my interest. With spring in New Zealand I am looking at what to plant for the summer season and actually bi-passed the herb section at our local garden centre last weekend – thinking that they were in the “to hard basket” and not knowing what to do with them. In the past I have dabbled in herbs and they tend to become invasive and have pulled them all out. Do you have any suggestions on stopping the spread of herbs? I have always been a huge fan of herbs and I have been working on them in my garden for a good while now. I have anise which is really loved by my wife and kids especially when they are preparing root vegetable dishes and fish soups. I will try it one day on myself or my family when one of us gets a stomach ache and see how well it works. Thanks a lot for the really useful post here. This is a real good time for me to learn new things to include in my garden. Out of all the herbs you listed, the only one I’ve grown in my garden is the basil. I’m the gardener at my house. I have a nice size vegetable container garden. I have tried other herbs but basil and peppermint are the only two that seem to flourish. Thank you for giving so many good details about the different ones. I see the chefs on tv cooking so much with cilantro but I have never used it. I use a lot of celery. Since they look similar, does cilantro taste anything like celery. I learned to cook with bay leaves growing up along the Gulf coast of Mississippi and Louisiana. I bookmarked your blog because I would like to have a small herb garden. I love herbs and was actually thinking about starting a garden, and this has motivated me to take a serious thought and turn it into action. All the listed herbs are my,favorites,but I am having difficult with rosemary hopefully I can plant that and have success, Cilantro is something I need to try also and I love Bsil I use it as a salad with tomatoes and mozzarella, I live In Italy and we use them a lot. Thanks great article with exciting information. I have always wanted to have something like a small garden where I leave but it seems the soil is not that adequate for it. There have been some few people around where I stay that have tried it but the soil wasn’t that good and they had to stop and packed it up for that reason. I was wondering if it is possible to grow these sought of herbs indoors. Maybe you have some recommendations on how I can go about this. And when your ebook is ready I would very much like a copy of it. I was thinking about starting my own herb garden in the spring time so I very glad that i found your website. I shall be book marking this ready for when i get going. I will need to go through each one in much more detail and work out which ones are good for the good old England climate so I most probably will be asking some questions to your expert self! Thank you for such attractive post on Herbs for the Garden: The A to C of herbs. I am not used to reading long posts, but this one is exceptional because it arouses my interest.I like plants and i have a small garden at my home. By reading this post i realised that there are many herbs i didn’t find are possible to be in my garden as i thought they are wild ones. But most of the time we need them for medicinal reasons and that why they might be near us of course in our garden. Thank you for giving me a new idea about my plants. I have always had a desire to have my own small herb garden at the back of my house. Though am yet to own a house and live in an apartment, my dream has being made more arrive by this article. Am now closer to my dream garden as I now have some herbs in mind that would do well in my garden just from this article. Having grown in a home with a kitchen garden, I can say i have experience with Cilantro/Coriander, Rosemary and Ginger. I would like to try planting basil and bay as I use them in my recipes. I can’t wait for more articles as we move all the way to Z. Am hoping by the time you do the ebook I will have bought my house and established my garden and will be trying out some of the herbs on your book. Reading your very informative article is a goal in the future to realize my own garden with herbs. I love adding to my meals herbs that you mention like anise, angelica, lemon balm, basil, laurel, cilantro and many others. As you explain, we must know the soil and climate requirements before planting. From now on I will frequently use your website to find all the information I need. Yes, I tried my hand at herbs this summer. I bought a couple of window boxes, the long ones, and I planted some small herb plants in them and labeled them all. Of course, being new, I didn’t know what they all looked like, so labels were key. I faithfully watered my plants and enjoyed fresh herbs all summer long. It was glorious. I cannot tell you how great they smelled on my porch. Amazing. Great article. I can really see your love of herbs! I am especially interested in the aromatherapy aspect of the herbs. It is sad how a lot of us forget there are natural remedies to help us with our illnesses or even for relaxation. I know I personally love to literally stop and smell the roses, because they just ease me from my stress. This is a lovely little encyclopaedia on Herbs, A to C. I love that you give me their common and latin genus names, what they look like, what they’re good for, the foods they’re used in … I truly appreciate well laid out articles like this. If I was not interested in your subject matter before, I am now! I currently live in an apartment building, high up on the 41st floor. I’m keen to start a herb garden but I have to be strict about which I can grow without it taking too much space. When you’ve completed your A to Z on Herbs, I would like to reference it for the development of my herb garden. Fresh is always better right? My grandmother grew a few herbs. I remember mint as I could always smell it without touching the plant or being right on top of it. I always seemed to relax smelling it. Probably strange but its true. I live in southwest Louisiana. If I wanted to plant a few herbs, maybe there or four, just for the aroma, what would you suggest? Keep in mind I live out in the country. Wild animals and people dropping off unwanted pets often. So it would have to not appeal to them or deter them. Great article! You made a very nice list of all these herbs with explanations and more importantly in what kind of dishes you can use them. I personally use basilicum a lot as I’m a pasta fan. I sometimes grow my own herbs, but due to the bad weather, I keep them in the kitchen. However, when I do that it seems to attract these very small flies. Any idea how I can prevent that? Hi Jim, How lovely to see how much information you have given on these wonderful herbs. The only one I haven’t grown before is Balm but I will give it a try. We have been through and really are still going through a bad drought in Cape Town and all but my Rosemary and Lavender herbs, have died. How sad to see them die off for lack of water. You have got me interested in growing herbs again and will grow a few on the balcony of my flat which is easier to carry dish washing water out to keep them damp. Can’t cart water downstairs anymore to the little garden there. Will be following your further posts with great interest. Thank you. You guys wrote this article in right time…I have my own garden so I think I should practice what I’ve learned in this piece of article. I have deep interest in Anise and Angelica because of climate condition in our country. Really impressive article, 9 out of 10- you leaved no stone unturned…very specific and interesting information (Green herbs for the garden) This info will help to develop my magic in the kitchen and build my own supermarket right in yard. Ooh also build park or my paradise. Wow! This is a lot of great information about herbs that would take surfing all over the internet to find. This is a great article! My only wish is that you also posted temperature ranges in Fahrenheit for all of the herbs listed. It is there for some, but not others. I am bookmarking this article for use in my herb garden. I can always look up temperature conversions later. Wow, I must say that even though I’m a bit tired, I really enjoyed reading your article on Herbs to the garden. Your detailed explanation on these herbs alone shows that you have a very deep knowledge about these herb plants. I love farming too, especially gardening, since were raised by parents who were already into farming. I have some good knowledge and experience about farming. Among the things you said about some of these herb plants, I like their uses as well as their medicinal value. For instance, I really like what the Anise plant is capable of doing, in terms of using it to flavor savory foods, fish soups and even root vegetable dishes. I also like it medicinal value, especially the fact that it could alleviate stomach pains as well as being anti viral. you also mentioned that it could be useful in destroying, or controlling, many of the bad bacterial pathogens. That really makes it very useful and a good herb worth growing. Also, the other plant, which is the Angelica, really catches my eyes. the plant looks very attractive to the eyes. No wonder insects like bees and other predators are attracted to it. I could see that it will be very good plant for ornament and beautification. Aside it beauty I also like it usefulness, especially the fact that the leaves can be added to salads and also it being capable of treating colds and arthritic pains. Indeed these plants are worth growing and investing our time and energy into them. I will probably consider growing the angelica herb plant since it is becoming my favorite now. thanks so much for sharing this useful information with us. Love your Post. I have a natural cure website and have written a post about growing herbs at home and a review for herbal gardening pots from Amazon. Your A To C herbs are most useful as culinary, aromatic and medicinal as well. Also, It will help to relax your mind growing and spending time in the herbal garden. In the meantime, you can make an earning on this also. I am expecting your next post. Thanks for a great post. You have an awesome website. It’s clean, organized and very informative. I’ve been traveling for the last few years, staying quite a while in one place before moving to another. I cook most days and I have been having a desire to not only use fresh ingredients, but fresh ingredients that I grow. It seems a bit impossible until I settle down. I wish I could plant a few herbs in some pots that are resilient enough to come with me when I go from one place to another. The first one, I might try from your list is the Balm herb. I love the medicinal properties. Thanks for the information. I look forward to coming back. I would like to create a herb wall garden, but I am unsure of the position due to the fact half the time the wall is in full sun, and the other half it is not. Can you suggest which herbs would be best with this kind of light situation? We live in Melbourne Australia so the winters get pretty cold (but not snow conditions) and the summer on some days can be really hot, but over all, summer is pretty mild in this part of the world, What would work best for this climate and can I plant at any time of the year? I really enjoyed your article on herbs. There are a few on there that I have grown. Angelica grows wild here in Alaska, and once you can be sure you don’t have poison water hemlock, it is free for the taking. I grow basil in my house every year, and cilantro on my deck. I would be very interested in a list of herbs that I could grow indoors, since we have such a short growing season and a cooler climate. Thanks for a good read. I love herbs and we plant many here as well. Of course we have some different ones here in Thailand but the coriander and peppermint my wife recognised easily. Coriander is one of the most often used in the Thai kitchen. Peppermint is more as a special to enrich some dishes eating raw leaves. It’s strange that Thais don’t know peppermint tea. It is sold in some shops coming from Europe but very expensive. Does the maggi plant not grow in you region? Great article and information about herbs. I was interested in the anise plant from that list. I don’t live in a tropical zone, but the summers are warm enough. My question is, can anise be reared in the greenhouse and what plants are not recommended next to it? For example, can I grow it next to tomatoes and cucumbers? Thanks for this article Jim. When my children were small, I always grew my own vegetables and preserved everything I could to last until the next growing season. The herbs I grew were basil, rosemary, thyme, and dill (for pickles and some relishes). These days I am interested in the fact that growing your own garden with vegetables and herbs allows you to know that they are organic and have not been treated with pesticides. Our foods these days contain so many toxins, so it’s nice to be able to grow wholesome foods. What really interested me from your article was the relationship between coriander and cilantro. I had no idea they were from the same plant! I have bookmarked this site and will be anxiously looking forward to the rest of your series. Hello Jim, how are you? I love your article about herbs. This remind my childhood. At the time that I was a little girl my step mother used to plant herbs in our back yard. We had all species of herbs and the best part for me was when I could go there and bring inside so we could cook with them. You are absolutely right when your say that fresh herbs is better than dry ones.I did not know the Anise leave can be each. That is a great information. Basil, is one of my favor herbs, normally I use in pasta and pizza, I put allots on food. Bay leaves in my house is used to cook beans and soups, I love the aroma allover the house when I cook with bay leaves. Cilantro is other favor for guacamole, Fish, salad, anything I can use. Parsley is not very much use at home in our cooks. I normally keep a pot or 2 of herbs in my patio and those are Rosemary that spreads around the vase, basil of course, mint and green anions; I leave in Florida so here the weather is good to plant most year long.Thank your so much for such good information about herbs. Thanks Jim, the bay leave, basil and coriander are Herbs I use regularly. But two of the herbs you mentioned in your post caught my attention. The first one was the Anise, I didn’t even know it was a herb. The next one is the Balm, I heard of the balm of Gilead and I thought it was an ointment. Maybe an ointment made from the balm herb. Hi Jim, We have recently been trying to get our little herb garden up and running and have a few of the types you have listed. I am very interested in trying the balm also as I can see some very beneficial uses for it that I had never thought of. We have always used herbs for cullinary reasons but had never thought of them for other benefits. I do knoe my grandfather used to put a herb on his sunspots – you might know which one he might have used?. He swore by it and reconed it cleared them up everytime. I am always sleptical when things like this are talked about in terms of curing mediical issues but I know he had the spots and they didn’t get him in the end.. This also may be a little off topic but my biggest problem with getting my herbs up and running is snails.. they are smashing everything I try and grow from seeds. we have cats so have to be careful with baits/pellets. Do you know of any good pet safe options? Thank you for this great post, you have included so much detail and covered some herbs that I hadnt even heard of before. I have to admit that I have never had much luck with growing herbs before so i will be sur eto take note of your comments on th esoil requirements and pH values, maybe this will help. Thanks a lot for all the useful info. Many years ago I did a 2500 square meter demonstration garden in Senegal and thereafter whenever I have had a plot of land to use, I’ve had a small garden. Lately I only have a balcony so I have started growing a few things in pots. I have some Thai red peppers and another longer green version that are going well. I came upon your website and found that you covered two herbs I have interest in, cilantro and basil. I am in the Philippines, so it looks like the basil is a go and the cilantro probably requires a little cooler environment. I’ll keep in mind the other conditions you outline and get started this week on the basil. I’ll be looking for letters d through z from you. I finally got my herb garden growing well after 5 years of trying! The lemon balm has got to be my favorite because of the absolutely beautiful red flowers. It’s funny you mentioned crushing the leaves in your fingers. I can not walk by my herb garden without crushing something and smelling it. It’s nice to see so many others appreciate herb gardening. I’m looking forward to next your installment! I have just started a little herb garden so I’m excited to come across your website. It would be great if I could grow my own herbs without having to buy them from the grocery store.I planted some seeds for Basil, Coriander, Parsley, Sage and Thyme right outside my kitchen window so that I remember to water them. I’ve gotten little sprouts growing for all except Sage. Will you be covering Sage in one of your upcoming posts? This blog offers an absolutely thorough coverage all aspect of a herb. This is part-1 of 8 covering A-C of blogs. Starting from how it grown, how easy to grow , pH level required, uses using culinary to medicinal, climate is described in a language every one will enjoy. I have basil (just shifted from from my deck to home, mint I grew from a small stem and it is still outside covering a big pot. You never need any work to grow them. I put them inside a small glass having some water while cleaning a bunch bought from store. It grew outrageously. I am really surprised it survived the cold weather below freezing and a 5-6 inches on snow. I am from India and my family has an organic farm growing several of them I love them picking and smelling. I eagerly look forward the next and next blog. Thank you for sharing. I expect this helpful blog will have a massive outreach. Herbs can help make recipes taste delicious and there are so many health benefits of herbs as well. Problem is that most herbs have been sitting on a grocery store shelf for a long time, and thus they don’t have much nutritional value left so if you grow herbs and spices in your own garden whenever possible you can always get high quality organic and natural herbs at home. I really enjoyed reading the article about herbs so thanks for sharing. I love growing herbs. It is wonderful to grow something that you can use in your meals and in cooking. I love chives, basil and parsley. The basil and parsley are also great for my rabbits. I have not heard of all of these herbs, like anise and angelica. Maybe next year I will try growing some cilantro. Hi Jim, this article is timely for me. Some time ago I decided to plant herbs with my friend, but she went away. Just this week I was thinking about starting the project myself but I had no idea where to start. I appreciate your article setting out the things that require consideration: the soil, climate, usages etc. I never knew, before this, that pH was also a consideration. Now I know all this I am encouraged to do my herbal garden project in my tropical climate. Thank you very much. I’m a chef by trade and I always wanted to grow my own herbs, just never got around to it. Your article is very motivating to get into growing you own herbs. There’s nothing like fresh herbs. Fresh rosemary and sage are excellent choices for roast chicken. Like you mentioned they also serve as a decorative plant. Fresh herbs are also very expensive to buy at a grocery store. So growing you own herbs is a win win situation. I will definitely consult this site for future reference. I am so glad you chose a subject I can relate to! My fingers have tried their hand at basil and been very successful, however, my chives didn’t even show. What did I do wrong? I totally agree that fresh herbs are the better choice when cooking. I notice a marked difference when I cook with fresh garlic as opposed to instant crushed garlic. The same goes for parsley and basil. Best I mark this website asca bookmark o I can use it as a handy reference in a hurry! What I like most is all your tips and specific infoon each herb. Thank you for the time and effort you have put into providing this information for us! Will definitely return! Thank you Ed. I’m glad you enjoyed this article. Please return to my site for more articles. Thanks Jim. Hi Jim,I am a member of the branch and I like to say “Bravo” that you have done a very good job as well. I like many plants and I’m curious to know more about the plants and their use.I am from Albania to Europe and here the climate is appropriate according to the information in your article.Using herbs in cooking I think it is healthy and cure for various illnesses.I think your hobby will be very successful because people are curious to know a lot about natural plants. I have not grown a garden in a long while.When I checked out Grandpa’s Green Thumb. I learned about herbs how they benefit the garden.Also learned that some herbs are used for medicine and some for flavors in food.These herbs benefit people as well.That is why I am thinking I might grow a herb garden myself. I enjoyed reading this post. Natural herbs are always my interest. 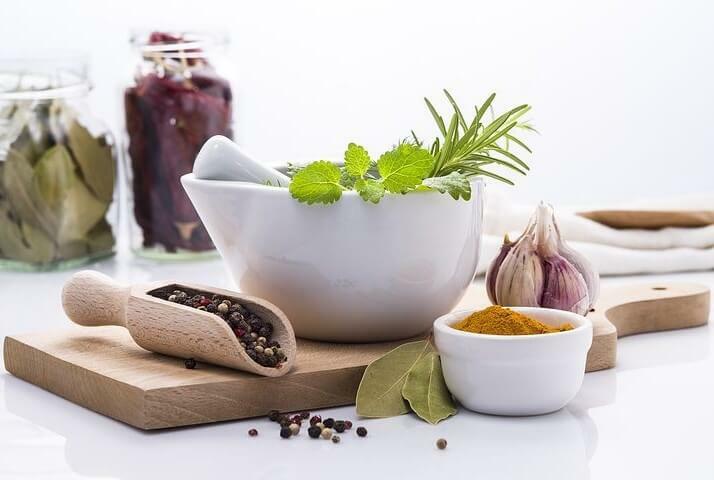 It’s great that you have created this site to help people with natural remedies for various symptoms and also natural ingredients for their preparing a healthier meal. Looking forward to reading your next post. Thanks for sharing this very useful information. Wow! Thank you for sharing these A to C herbs for garden. The truth is I am not familiar with and I have not seen any of these herbs before. They look beautiful in look and have so much Value. I have heard about basil before but I don’t really know much about it. This article is so full of useful information regarding the mentioned herbs from the Latin names to harvesting. Quite interesting. I’ve tried to grow some herbs and a very small spot by my home. They actually did pretty well; while some of them. I found out that some actually very strong perennials! I think it was a spicy oregano that still comes back year after year even though I’ve tried to start going something else in that space. I’ve never heard of the spice Angelica! Probably because it is more common in other parts of the world (and I’m not all that great of a chef). Although I have to say by looking at the picture it definitely looks like something that is growing wild in the grassy area next to my home. Is Angelica known to grow wild? The balm photo looks a lot like some mint I tried to grow once. Are they in the same family? Thanks for the fun post and I look forward to learning more about herbs as you post.